The first portable typewriter was a Blickensderfer or Blick, designed by George Canfield Blickensderfer. It used a cylinder which carried raised letters. When you pressed a key the cylinder rotated to pick up ink and to press the correct key to the paper. The first portable typewriter to work in a conventional way was the Corona 3. It launched in 1912 and sold like hot cakes. People took to portable typewriters. They took up less space and were cheaper than full size models. If you needed to type the odd business letter or essay for university or college, they were ideal. Manual portable typewriters sold from the 1920s to the 1990s in Europe and in the USA. Electronic typewriters and computers replaced them in the 1980s and 1990s. Some of the last manual portable typewriters were the Olympia Traveler Deluxe and the Olivetti Lettera 25. Today manual typewriters are enjoying a revival. Restored models sell on eBay for £100 or more. But you can also get unrestored portables in working condition for a few pounds on eBay. The Corona 3 had a unique folding design, but later typewriters did not fold. Their carriage was further back. They did not look 'upright' as conventional office machines did. As there was no need for a complex folding mechanism, the new typewriters were simpler, but none was as light as the Corona 3. So people who wanted a very portable typewriters still bought it. Source: The Army & Navy Stores General Price List 1937-38 page 385. Prices are in pounds, shillings and pence. Manual portables were as popular as ever in the 1950s and the Consumers' Association magazine, Which? reviewed typewriters twice in the 1960s. Source: Which? December 1962 pages 358-359. Prices are in pounds, shillings and pence. In the 1960s, manufacturers refreshed models quickly. In 1968 the following typewriters were available. Source: Which? June 1962 pages 178-179. Prices are in pounds, shillings and pence. In this list are the first Japanese imports. The UK Government restricted imports from Japan until the late 1960s. The first electric typewriters for the consumer market appeared in the 1970s. But most people still bought manual typewriters for home use. (*) I remember Owen Owen in Coventry sold Olivetti Lettera 32s in the early 1980s, but they may have been old stock. 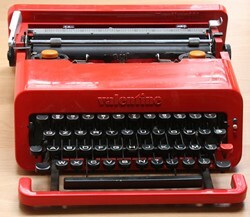 The Olivetti Valentine is the most famous portable typewriter from this era. Its designer, Ettore Sottsass, called it an 'anti-machine invented for anywhere but the office'. The bright red plastic typewriter was available in the UK from 1969 to the early 1970s. It is hard to believe it was a great success, as it quietly disappeared from retailers around 1973. This means the model is rare today. Expect to pay from £100 to £300, but a rare new old stock one sold for over £1000. In 1969 it was the cheapest of Olivetti's range selling for 18 guineas (£18 18s). Seiko of Japan (famous for watches) made Silver Reed typewriters. 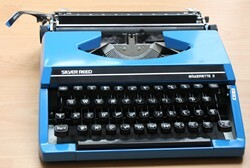 Seiko first sold typewriters in the UK from around 1976. The most basic model was the Silverette. The original version was yellow with a black keyboard. Silver Reed changed this to black with a white keyboard in 1980. They added the Silverette II to the range in 1983. This was my first typewriter. Source: Argos catalogues 1976 to 1990. The dates are the first and last dates the typewriters were advertised in Argos and in 'The Times' newspaper. Professionally refurbished vintage typewriters will be worth a lot more than unrestored examples. The reason is the cost of the labour involved. Expect to pay at least £30 for a fully working restored typewriter. A restored typewriters will give the most reliable performance. You will be paying for a professional service and some sort of guarantee. If you want to take a chance on a working, but unrestored typewriter, you will save a lot of money. Expect to pay from £10 to £30 for vintage typewriter in good condition and described as working. 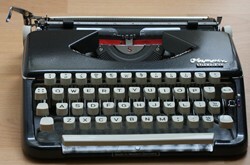 Many sellers cannot be bothered to post typewriters so look for 'collection only' items near to you for a real bargain. They get few bids. Century of the typewriter by Wilfred A. Beeching is a great souruce of information and dates of manufacture for most makes of typewriters from the early days to the 1970s.